Our commitment to excellence will exceed your expectations! EXiT One Realty is located in Broomfield, Colorado. Our office is staffed with some of the most experienced Real Estate Professionals in the Denver Metro Area, including 4 Past Presidents of the local Board of Realtors® and the Past President of the Realtor® Builder Council. Our Realtors® have well over 100 years combined experience in the Real Estate Industry. 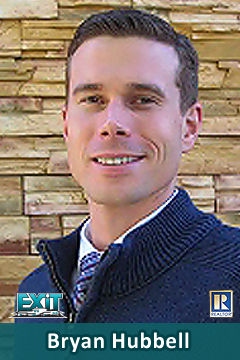 What’s different about working with Bryan Hubbell and EXiT One Realty? Our commitment at EXiT One Realty is to provide the highest level of service to both our clients and the community. We take great pride in constantly surpassing our client’s expectations. Whether you are an experienced buyer or seller, or first time buyer we always aim to make your experience as stress free and smooth as possible. Through my training provided by EXiT Realty, either through corporate programs, in house training at EXiT One, or personal mentors, I have gained a unique understanding of how to use traditional outbound marketing combined with a dynamic inbound internet marketing presence that provides maximum exposure to the market place, and allows me to gain an edge over the competition in the area. Furthermore, I have a great understanding as to the needs and desires of those who reside in the Superior/Louisville area of the Front Range of Colorado, as this is also my home. My personal vision is to continue to cultivate an active real estate market in these and surrounding areas, while continuously training and updating my marketing skills to leverage today’s technology to better serve my clients. I look forward to connecting with you and discussing in detail how my affiliation with EXiT One Realty, my personal business experience, unique skill set, and personal tenacity combined with inbound and outbound marketing gives me the ability to better assist both buyers and sellers in accomplishing their goals. Let me help you get to where you want to be! I am more than fortunate to have a loving, caring, beautiful and amazing wife and our puppy – yellow Labrador (our pride and joy). I thoroughly enjoy getting out for a good round of golf, the three of us going for drives to explore our beautiful home state of Colorado, and especially love our Sunday’s in the kitchen preparing amazing meals, after all they say the best food is made with love!